This try diving programme is a half day experience starting daily at 9 am or 12 pm. This adventure includes an introduction and gear fitting with a member of our dive team, a confined water skill practice and an ocean dive! For everyone ages 10+ who is in good physical health. TripAdvisor Hall of Fame & 2018 Award of Excellence! As a PADI 5 Star Scuba Diving and Snorkeling centre we provide a wide range of options for all levels. PADI scuba diving training is offered daily from beginner to professional level. 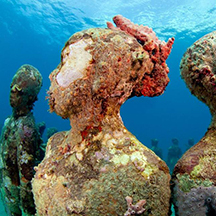 Or snorkel with a group or with the family over our beautiful reefs or our World's First Underwater Sculpture Park. We are locally owned and operated and run by qualified Marine Biologists we always have ECO activities going on. Eco Dive – Pure Diving in Grenada © 2019. All Rights Reserved.